Dorothy Wordsworth (December 25, 1771 – January 25 1855) was an English poet and diarist. She is probably best known, however, as the sister of famous English Romantic poet, William Wordsworth. While she made notes on her brother's writings, and often helped him, she was an accomplished writer in her own right; her works including numerous poems and journals. She did not publish anything during her own lifetime, but much of her work was only discovered and published after her death. Her stature rose after the discovery of her journals, in part due to the growing recognition of women's contributions as a result of the rise of the women's movement and Feminism. Due to her suffering from various mental illnesses, she was something of a recluse in her later years, even hiding from guests and visitors. She died in Rydal Mount on January 25, 1855. 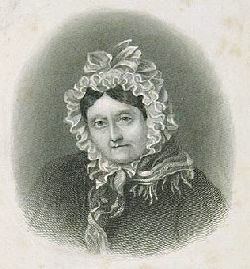 Dorothy Wordsworth was born in Cockermouth, Cumberland. She was the third of five children. Dorothy spent her childhood with various relatives. Ann Cookson of Penrith, her mother, died when Dorothy was six. "I know," she later wrote in her journals, "that I received much good that I can trace back to her." Dorothy's father, John Wordsworth, an attorney, died when she was just twelve. He died intestate, his affairs in chaos, at which time, Dorothy was removed from boarding-school. Due to her parents' untimely deaths, she did not spend much time with her brothers, as she was forced to move frequently. At the age of fifteen, she went to her grandparents in Penrith and met her brothers again. However, she was not to see much of them before she was 23. From 17 to 22, she lived at Forncett Rectory, Norfolk, where her mother's brother, William Cookson, took her in. She enjoyed her life in Norfolk more than at her grandmother's house. She read, wrote, and improved her French. After the winter of 1793/4, she continued to stay in various other places. Wordsworth began writing in about 1795, when she shared a house in Dorset with her brother, William. At Alfoxden, Somerset, she became friends with the poet Samuel Taylor Coleridge, traveling with him and William in Germany (1798-99), where they had lodgings in Goslar. Coleridge spent a good deal of time in the University city of Göttingen. For the journey she bought a notebook, which she used for her daily affairs. It contained, among others things, lists of the clothes, from shirts and nightcaps to fur items, that she would need in the cold winter, and also a list of groceries—bread, milk, sugar, and rum. In Alfoxden, she started her first journal, and then kept several other journals of her travels and expeditions. Her thoughts and writings were an important source of stimulation for Coleridge and William. The three of them, Colridge, William, and Dorothy, were often referred to as one being, as they exhibited so many of the same thoughts and beliefs. With her brother, Dorothy occasionally played a curious game; they would lie down next to each other outdoors, pretending to be in their graves. Some biographers have speculated about a strong mutual attraction between the two. William's poems, such as "Lines" and "To My Sister," give no hint of any incestuous attraction, but do express his happiness, when she accompanies him on the walking trips. They two of them were very close in spirit and mind. In 1799, Dorothy settled with her brother in Dove Cottage, Grasmere, in the Lake District. It was her first real and constant home since her mother died. In 1802, William married Mary Hutchinson, who was Dorothy's best friend. The marriage was happy but Dorothy was too hysterical to attend the wedding. A few days before the marriage she wrote to her friend: "I have long loved Mary Hutchinson as a Sister, and she is equally attached to me this being so, you will guess that I look forward with perfect happiness to the Connection between us, but happy, as I am, I half dread that concentration of all tender feelings, past, present, and future will come up me on the wedding morning." When Thomas De Quincey met William at Grasmere in 1807, he also made the acquaintance of Dorothy. In the household also lived Mrs. Wordsworth, two children, and one servant. De Quincey was impressed by the Lake District, with its small fields, miniature meadows, and solitude, and noticed Dorothy's strong and maternal influence on William. Dorothy remained in Grasmere, the Lake District, until 1813, when she moved to nearby Rydal. In 1829, she became ill and was obliged to lead the life of an invalid. From 1835, she developed arteriosclerosis and for the remaining twenty years, she suffered from mental problems, possibly originating in a thiamin deficiency. Due to outbreaks and fits, she often played with a bowl of soapsuds and hid from visitors. Dorothy Wordsworth died in Rydal Mount on January 25, 1855. Dorothy Wordsworth started to keep her journal in the late 1790s, recording walks, visits, conversations, and above all, the world of nature, in which she was fascinated. The journals were not intended for publication. Suppressing her ambition to become a writer, and devoting herself to domestic duty, she once said: "I should detest the idea of setting myself up as an author." When we were in the woods beyond Gowbarrow park we saw a few daffodils close to the water side. We fancied that the lake had floated the seeds ashore and that the little colony had so sprung up. But as we went along there were more and yet more and at last under the boughs of the trees, we saw that there was a long belt of them along the shore, about the breadth of a country turnpike road. I never saw daffodils so beautiful they grew among the mossy stones about and about them, some rested their heads upon these stones as on a pillow for weariness and the rest tossed and reeled and danced and seemed as if they verily laughed with the wind that blew upon them over the lake, they looked so gay ever glancing ever changing. This wind blew directly over the lake to them. There was here and there a little knot and a few stragglers a few yards higher up but they were so few as not to disturb the simplicity and unity and life of that one busy highway. It is clear by the similarities of subject matter and style that Dorothy was a large influence on her brother William, and his writings. Other works, such as her brother's poems, "Beggars" and "Daffodils," use her precise descriptions of the countryside and life in Dove Cottage. For nearly a century, Dorothy Wordsworth was relegated to a footnote in her brother's life. Then, in 1931, Dove Cottage, the Lake District home where Dorothy and William lived for several years, was bought by Beatrix Potter, author of Peter Rabbit, and other children's books. In the barn, Potter found a bundle of old papers and realized that they were Dorothy's journals. Potter's discovery was published in 1933 as The Grasmere Journal. The journal eloquently described Dorothy's day-to-day life in the Lake District, long walks she and her brother took through the countryside, and detailed portraits of literary lights of the early 19th century, including Samuel Taylor Coleridge, Sir Walter Scott, Charles Lamb and Robert Southey, a close friend who popularized the fairytale Goldilocks and the Three Bears. Dorothy Wordsworth's works came to light just as literary critics were beginning to re-examine women's role in literature. The success of the Grasmere Journal led to a renewed interest in Wordsworth, and several other journals and collections of her letters have since been published. Although she did not care to be during her lifetime, Dorothy Wordsworth has now become somewhat of a literary icon, not just for her influence over her brother's work, but for her own as well. ↑ Stephen Greenblatt: The Norton Anthology of English Literature, Volume 2: The Romantic Period through the Twentieth Century (New York: W. W. Norton, 2005). ↑ Stephen Greenblatt, The Norton Anthology of English Literature, Volume 2: The Romantic Period through the Twentieth Century (New York: W. W. Norton, 2005). ↑ William Wordsworth, I Wandered Lonely As A Cloud (Read Me a Poem: Classic Poetry for Modern Children) (Lobster Press, 2007). This page was last modified on 11 October 2017, at 19:59.